The world premiere of Rugrats In Paris took place Sunday, November 5, 2000, at 11AM PT at the legendary Mann's Chinese Theatre in Hollywood. The regular voices were there, along with the series' newest regulars, Dionne Quan and Debbie Reynolds. Also, the main staff involved with the film were also in attendance, along with some of the musical artists who appeared on the soundtrack, such as Aaron Carter, No Authority and Mylene Farmer. And of course, you can't have a world premiere without a bunch of celebrities who have no relation to the picture, such as Jack Nicholson, Eddie Murphy, Ray Romano, Dylan McDermott, Jodie Foster, Melissa Etheridge, Pierce Brosnan (James Bond 007), Sela Ward, Natassia Kinski, Kim Delaney, Jane Seymour, Carrie Fisher (Debbie Reynolds' daughter), Rosanna Arquette, Keenan Ivory Wayans, Mimi Rogers, Beau Bridges, Mariel Hemingway, Harry Hamlin, Eric Idle (Monty Python) and Coolio, plus Nickelodeon TV regulars like Mike O'Malley (Double Dare 2000), Philip Van Dyke (formerly Arnold of Hey Arnold) and Amanda Bynes (The Amanda Show). Also, Shannon Stephens, the US winner of Nick's voice role contest (see below) was there, too. Keep in mind, though, that the stars weren't the first to see the final product of this movie -- the day before, Saturday 11/4, a screening was held for industry officials and critics at Paramount Studios. Finally, other critics, the media and invited guests attended an invitation-only screening of the film on Veterans' Day, Saturday 11/11 at the Paramount Theater in Los Angeles. Similar screenings were held nationwide in the days leading up to public release. According to Ananova, a Nickelodeon webchat on 11/30/2000, which tied in with the release of the film, was "hijacked" by two hackers, "Murphy" and "Joker", who had the Rugrats say quite nasty things, shocking its young fans and their parents. What happened was that AOL, which handled the technical facilities for the chat, received a false e-mail, containing a "Trojan Horse" virus disguised as an official software update; the virus disclosed the passwords used to restrict access to the software used for the chat. After they activated this update, the technical staff inadverently given up control of the chat to the hackers, which then proceeded to do the dirty work. During the time the Rugrats had dirty mouths, parents complained about their content, prompting the staff, unable to regain control, to make frequent apologies until the hackers logged off. As you may recall, the Mother's Day episode of the TV series explained that Chuckie had a mommy, but never directly mentioned that she died shortly after Chuckie's birth. To get the idea that she died, you have to, more or less, read between the lines. However, in the film, it is mentioned directly that Melinda did indeed die while Chuckie was very young; however, we still don't, or won't, know how she died, apart from the fact that it was some disease that required hospital care. At least Nick didn't try to pull a "Dead Parrot Sketch" ("Monty Python" reference) in the movie. Melinda will be involved in both the TV prequel and the movie, as Chazz reminisces from the days when she was his wife. One thing from Mother's Day that will be featured in the film is her box of momentoes -- pictures, garden tools and her diary. But one important addition to the box is Wawa (left), Chuckie's ragged, purple teddy bear that gets Chazz thinking about marriage again. If you think "Diaper vs. Diapie" and "Carmichael vs. Carmichaels" from The Rugrats Movie is ridiculous, get ready for "Kimmi vs Kimi". 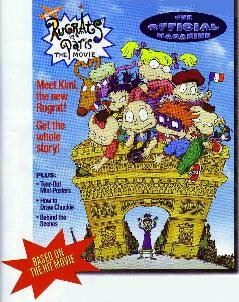 In all the sites and press releases that bear the new Rugrat's name, her name is spelled "Kimmi". However, at Nick.Com's Rugrats In Paris site, her name is spelled "Kimi" (the video game press release has her name spelled "Kimmy"). So what's the correct way to spell her name? Apparently, it's "Kimi", as Nick is using this spelling in all publicity material, including their website, ads, posters and merchandise. And don't get me started on explaining Dion Kuan vs. Dionne Quan, except for the fact that the latter's correct. And while were at it, let's talk about the 2 Jean-Claudes. Jean-Claude is Coco LaBouche's assistant, and is just as mean as her. However, in the Rugrats scheme of things, there's another, more-friendlier Jean-Claude -- Jean-Claude DuMonde, who was introduced in the Angelica's In Love episode, and was also featured in the Bonjour, Babies! chapter book. Keep this in mind next time you see either Jean-Claude around. The newspaper strip also had a special 2 weeks (???) of strips set in Paris, pencilled by Roberts, written by Roberts, Gordon Kent and J. Torres, and featuring the first comic-strip appearance of Kimi, in the 11/30 daily strip. The sequence started on 11/26/2000 and ran for at least 2 weeks. 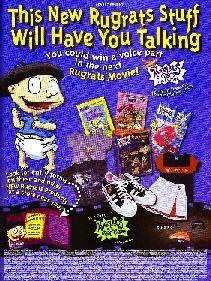 Finally, the November 2000 issue of Nickelodeon Magazine (right) featured some special items about the film, including a Rugrats cover and an interview with John Lithgow. The December 2000 issue features an interview with Susan Sarandon. The movie magazine was priced at US$4.95 (C$5.95 in Canada), and was sold wherever fine magazines are sold. It was also available through mail order. On 8/28/2000, the winners have been announced for a contest where 3 lucky winners, one each from the US, Britain and Australia, get to record a bit role for the movie. The British and Aussie winners, Ben Sunderland from England and Hannah Makragelidis from New South Wales, Australia, will record their roles in their home countries, while the US winner, Shannon Stephens, will go to Paramount Studios in Hollywood to record her role; she'll return in November to catch the world premiere of the movie. Likewise, Ben & Hannah will attend the national premieres in their own countries. Finally, all 3 winners will see their names in the closing credits. 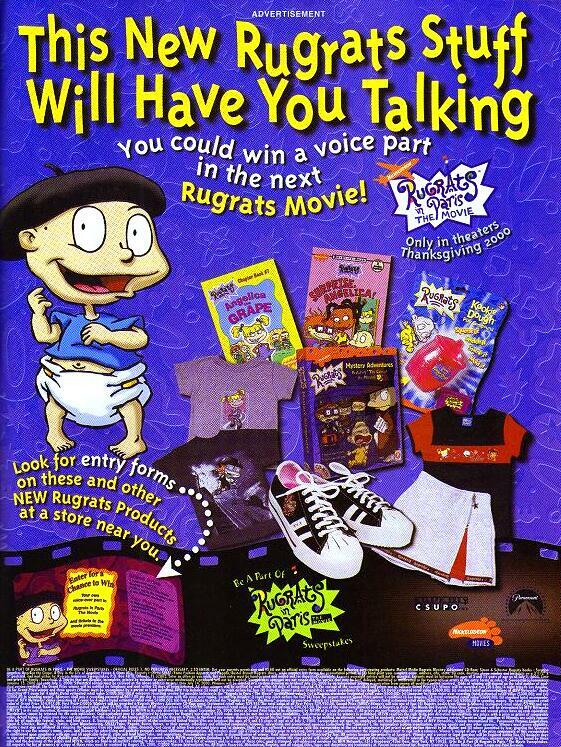 All winners will also receive an assortment of Rugrats merchandise and cash (Shannon will receive US$4000). The contest was presented in association with various licensees in the US (including Mattel and Simon & Schuster); and with the Woolworth's retail chain in Britain; Nick went at it alone in Australia. All 3 of them are credited as pre-schoolers in the film. Nick Latin America held a similar contest for the Spanish version of the film, due for release sometime in Spring 2001. Here, the winner will receive similar prizes, then fly with one other parent to a city to be specified, for recording. The only flaw, though, is that a Spanish version has already been completed, for Puerto Rico and Hispanic markets in the US. The role the winner will be doing will be in the version seen in the rest of Latin America and Spain, most likely insterted into the existing Spanish version. 1. David Weiss & J. David Stem, the writers of The Rugrats Movie, will write the sequel, but they will not be alone; Jill Gorey & Barbara Herndon, and Kate Boutilier will also lend a hand in the writing process. 2. The sequel will be directed by Paul Demeyer and Stig Bergqvist; Demeyer was sequence director for the first film and creative producer for the TV series' 1997 episodes; Bergqvist is well-known as the creative producer for the BBC's Stressed Eric mini-series, a Klasky-Csupo production. 3. According to a Nick.Com chat on 6/22/2000, one of the Rugrats (besides the older ones such as Angelica) will also start talking to the grown-ups. In my opinion, Chuckie will probably be that Rugrat, as, at 2 years of age, is capable of speaking in understandable English (see the film if you want to really know who). Click here to see that chat. 4. Dionne Quan, the voice of Kimi, is legally (though not totally) blind, and had to read special Braille versions of her scripts. For more details, see Kimi's character description. 5. And most importantly, according to a Viacom press release, Chazz WILL be getting married in the new movie, and through this marriage, Chuckie will have a new sister named Kimi and a new mother named Kira. And, as I mentioned before, Grandpa will also marry again; this time, to a woman named Lulu. MTV Asia reported that 98 Degrees will be doing the theme to the Rugrats sequel, according to the VJ that introduced the Asian premiere of their video, "I Do Cherish You", on 8/21/99. However, according to Maverick's press release, 98 Degrees will NOT be featured in the film or the soundtrack; their only connection with the film is Merlyn Music, who will be co-producing the first album by Amanda, an artist who will be featured on the soundtrack. Also false are rumors that David Bowie's song, Sky Life, would be used in Rugrats In Paris. This song was cut from the film and the soundtrack of The Rugrats Movie. If it does surface somewhere, it won't be in the Rugrats In Paris soundtrack. 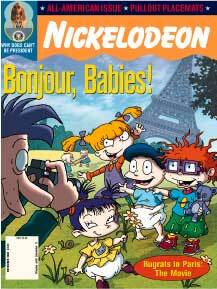 There were rumors that Angelica will have a baby sister named Stephanie, either in the 8th season or in Rugrats In Paris. However, according to her voice, Cheryl Chase (via an online chat which Quentin R. participated in), these rumors are false, as the producers do not plan to give Angelica a baby brother or sister anytime soon. Cheryl's reaction to the rumor: "There's only one Angelica." Besides, it would be too soon for Didi, Betty, Charlotte or Dr. Lucy to give birth. Titles originally announced or used only as working titles were The Rugrats Movie II and Chuckie's Dream. There were also rumors that the Rugrats were going to add a year or two to their current ages. While this makes sense, unfortunately, they will remain the same ages as they've always been. In the Nick.Com chat on 6/22/2000, writer Mark Valenti has, sort of, reaffirmed the notion that they'll always remain as old as they are now. One of these false rumors also included a possibility that a jewel thief would be among the new characters; but, according to Nick's website and other sources, there will be no jewel thieves in the film. 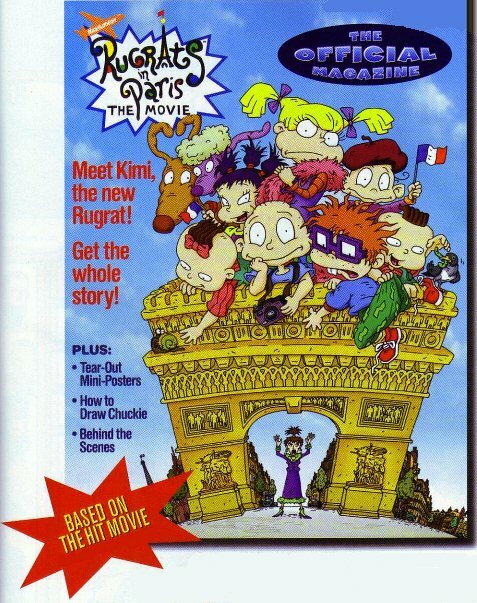 Also debunked is the rumor that there won't be any Rugrats sequel at all, according to the "Rugrats Mania Club" newsletter; as you can see, if there was no movie, you wouldn't have seen it at the theater, and, probably, you would've either seen another film or stayed home.